This very important and legendary group was formed in Cologne in July 1968, on the initiative of Irmin Schmidt (keyboards) and David Johnson (flute). They aimed to make a totally new music by merging very different musical styles. Irmin Schroldt and Holger Czukay had both studied under Karl-Heinz Stockhausen and had some background in jazz ensembles. In addition to this, Schmidt had been educated at the Dortmund Academy, studying walthorn and orchestral direction. Jaki Liebezeit had since his early schooldays played trumpet, flute and percussion, but he eventually settled behind the drum kit in a free jazz band. Michael Karoli was ten years younger than the other members, and the only one not to have an academic background. His musical training came from several unknown jazz-rock groups. It was Jimi Hendrix who inspired him to play in a rock band. David Johnson was an American avant-garde composer. At the end of 1968 he left the new-founded group and returned to his homeland. Just before that, another American citizen had joined the group to complete the line-up, a black vocalist named Malcolm Mooney. The only recording of these six musicians playing together is the very obscure single "Kama Sutra Parts I & 2" (Metronome M25-128), which for some unknown reason was only credited to Irmin Schmidt! In 1984 one had the opportunity to hear Can's first ever concert (as a five piece featuring Johnson) on the cassette release Prehistoric Future (Tago Mago TM 4755, limited edition of 2,000 copies released in France). Can finished their own primitive studio and dubbed it Schloss Norvenich in January 1969. For most of their career, all their recordings were made there. In spite of just having a four track tape machine at their disposal, the recordings were of a high technical quality, partly due to the great technical ability of Holger Czukay (acting as their engineer and tape editor). Their first set of finished tapes were circulated to several record companies. It is possible that the Delay 1968 album (1981) was compiled from these tapes. As Can didn't get an initial response, they wasted no more time approaching record companies but made further recordings, resulting in Monster Movie (1969), being released by themselves as a private pressing of 600 copies. This was indeed one of the rock history's most radical and inventive debut albums! In December the same year, a recording contract with Liberty / United Artists was signed, and Monster Movie was repackaged and released again. If inspired by a number of avant-garde composers as well as Jimi Hendrix, Pink Floyd and Velvet Underground, Can definitively managed to create their very own, unique style. This was characterised by gasping, repeated and spoken vocals, heavily distorted guitars, shimmering organ, a simple and ritualistic bass and sensitive rhythms. Indeed this album was the reference point for most of their subsequent albums, particularly the classic tracks "Father Cannot Yell" and "You Doo Right". Can usually recorded their music live in the studio - playing, toying and improvising to great effect! Amon Duul II's first album Phallus Dei (1969) was the result of a similar process, resulting in a handful of reasonably structured "songs" and one lengthy full blown improvisation as a conclusion to the album. If Monster Movie had been the soundtrack to Can's very own, imaginary headmovie, they were soon contacted by several movie directors to make real film soundtracks. In October 1970 the album Soundtracks was released, containing music from five different movies. Most of it was more accessible than Monster Movie, but nevertheless the album had its share of classics: "Soul Desert", "She Brings The Rain" (these two tracks were also the A and B sides of a single on Liberty 15340) and "Tango Whiskyman" are worthy of note in this respect. The recordings were produced over a twelve month long period, and featured new vocalist Damo Suzuki on four tracks. Malcolm Mooney had become mentally ill, left the group and returned home to the USA in December 1969, thus ending the first phase in Can's history. Can had searched for a new vocalist for four months, before they discovered the Japanese replacement Damo Suzuki busking in the streets of Cologne. His strength was his peculiar phrasing technique rather than his vocals, a strange styling that was indeed appropriate for Can's rhythmic and repetitive music. With Suzuki in their ranks. Can went on rehearsing and recording Tago Mago for the rest of 1970. This varied double album, reputably taking the name from a magician, is usually considered to be their best work. As many of the Amon Duul II albums from the same period, it had one record with a somewhat structured work, and the other containing much weirder, improvised experiments. "Paper House" lifted the album off with menacing slow, progressive rock and "Mushroom" introduced the unique, rambling Can rhythms, here with strange echo and reverb effects added. "Oh Yeah" started off with an explosion gradually evolving into a hypnotic and repetitive melody with added backwards effects. "Halleluwah" was a foretaste of the rhythmic music Can were to work with on their next album Ege Bamyasi. "Aumgn" was a very strange and ritualistic sound collage, lacking ordinary rhythms or melody lines. Instead it featured plenty of strange, non-verbal vocal sounds and crashing percussion, with lots of weird echo effects directed by Irmin Schmidt. Liebezeit played contrabass on this track. "Peking O" was probably the weirdest Can track ever, far too insane to be described! "Bring Me Coffee Or Tea" closed the album in a, by Can standards, more normal way. This was a real masterpiece of German rock containing abnormally imaginative music! In fact, the album did surprisingly well; it sold enough to enter the German best-seller lists, peaking at number 38! (This would never have happened if the album had been released nowadays!) International rock critics had great difficulties when they attempted to describe Can's music. Many of them saw the group as: 'the German Velvet Underground or Mothers Of Invention'. For sure, these descriptions were only used for lack of better Anglo-American reference points. A 45 was also selected for release from the Tago Mago sessions: "Turtles Have Short Legs" coupled with "Halleluwah (edited version)" (Liberty 15465). Further soundtrack projects brought Can even more attention. The track "Spoon" was the main theme from a German television series and was released as a single in time for the Christmas of 1971, coupled with "Shikaki Maru Ten" (on United Artists 35304). It was a triumph for the whole wave of new German rock (the so-called "kraut-rock") when this single actually sold more than 200,000 copies and reached number 1 on the singles' charts! Due to this rather unexpected success. Can were virtually forced to play live gigs. Their first British tour (in the Spring of 1972) received much enthusiastic support. At the same time, Can also launched their third single: "Vitamin C" (another movie theme) coupled with "I'm So Green" (U.A. 35472). 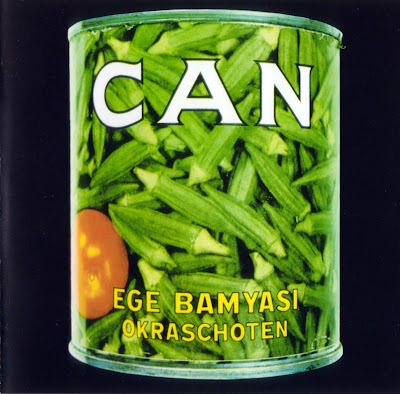 The new album Ege Bamyasi (released August 1972) had Can's distinctly rhythmic music in focus. Many of the tracks' arrangements were unusually sparse - featuring ritualistic percussion and Suzuki's spoken and/or breathing voice. Other tracks were songs in Can's unique style, short and quite melodious, but at the same time bizarre! The best example of this was "Spoon". In spite of these elements, Ege Bamyasi wasn't as exciting as Tago Mago. Luckily they came up with another big one in l973, the inventive Future Days. This time Can relied more on atmosphere than power. Things had certainly changed since the agony of Monster Movie. The long title track (which opened the album) was a particularly good example of their new style. Tile track "Spray" parodied rock riffs, while "Moonshake" also was released as a single with an edited version of "Future Days" on the other side (U.A. 35596). "Bel Air" was a lengthy improvisation, covering a full album side (edited from a very long session!). Damo Suzuki performed his last concert with Can on the 25th August 1973 in Edinburgh and then returned to Japan. The group recorded their 1974 album Soon Over Babaluma as a foursome. This was an even better collection than Future Days containing further lively experiments with refined rhythms from all around the world. Schmidt and Karoli now shared the lead vocals parts. "Dizzy, Dizzy" was a fast number with whispering vocals, electric violin and echo drumming. "Come Sta, La Luna" had melodramatic vocals by Schmidt, radio talk over and bird screams caught by Czukay and a perverted tango rhythm from Liebezeit. You've never heard such a tango before! "Chain Reaction" (11:12) had furious percussion with several tempo shifts - complete madness! "Quantum Physics" calmed things down a bit, as it rolled more on atmospherics. Soon Over Babaluma must be regarded as Can's best album after Tago Mugo! Short versions of "Dizzy Dizzy" and "Splash" were released on a single (U.A. 35749). In 1975 Can signed new recording contracts - with EMI Electrola in Germany and with Virgin world-wide. United Artists, for their part, released 15,000 copies of a retrospective album aptly entitled Limited Edition. It contained previously unreleased tracks recorded between 1968 and 1974. There are many really bright moments in this collection, like the strange story of "Mother Upduff" (told by Malcolm Mooney) and "Gommorha" (another soundtrack theme), a characteristic Can instrumental. In 1976, this collection was made available again by EMI and Virgin as side one and two of the double album Unlimited Edition. Sides three and four offered a new selection of previously unreleased tracks. This Can release, recorded live in their studio in countless styles and moods, was as great as most of the conventional Can albums! Landed (1975) was their last album of sheer excellence and at the same time their first 16 track production. Karoli played his most fuzzy guitars since Monster Movie on the tracks "Full Moon On The Highway" and "Vernal Equinox". Can's British live sound engineer Peter Gilmour contributed lyrics to this and their two subsequent albums. The track named "Unfinished" really sounded as it never was finished, and revealed (in my opinion) the first signs of Can's forthcoming creative stagnation. Different vocalists were tried out at this time: the Japanese female singer Michiko Nakao, Tim Hardin (performed a song live with the group on one occasion), Michael Cousins and the Indonesian Thaiaga Raj Raja Ratnam, but none of these remained with the group. As usual, a single was lifted off the album: "Hunters And Collectors" coupled with "Vernal Equinox" (Harvest IC006 31392). Flow Motion (1976) was an attempt to make more commercial music with funky rhythms and new guest vocalists (Peter Gilmour and Rone Timmer). The abnormal group Can had finally turned normal, though they remained somewhat eccentric. Their funk rock single "I Want More" coupled with "...And More" (Harvest ICOO6-31727 in Germany and Virgin VS 153 in the UK) climbed into the British charts. For Christmas 1976, Can released a disco version of "Silent Night" coupled with "Cascade Waltz" (Harvest ICOO6-31973 and Virgin VS 166). Unhappy with this new direction, Holger Czukay began his withdrawal process from Can. The group was now expanded by two former Traffic members: the bassist Rosko Gee (who actually was brought in on the initiative of Czukay!) at the end of 1976 and the percussionist Reebop Kwaku Baah in the beginning of 1977, and just in time for the Saw Delight sessions. Can's legacy to the German rock scene is indispensable, they were a unique group with a unique sound. Recorded at Inner Space Studio 1972.